I love bacon. It was one of the few things I would eat as a picky child, much to the dismay of my mom. (Other choice items included plain white rice and Coco Pebbles). 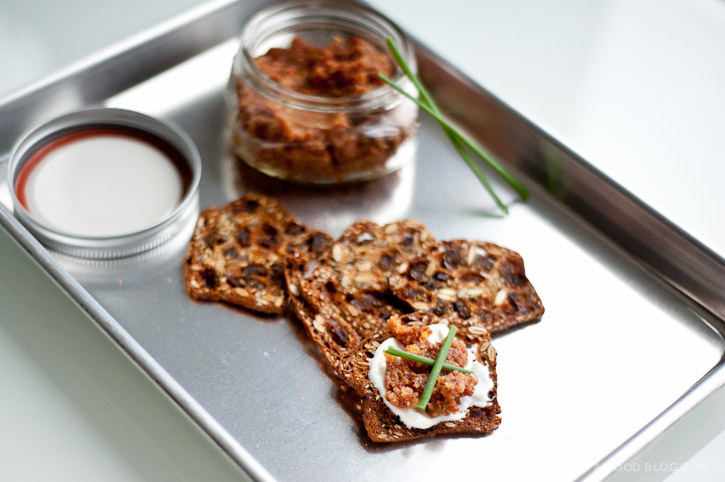 If they had bacon jam back in the day, you better believe that it would have been one of my staples. Bacon is one of those things that makes everything better. I can only imagine how this would taste in a BLT. Extra bacon? Yes, please! I adapted this recipe from one I found on Martha Stewart. 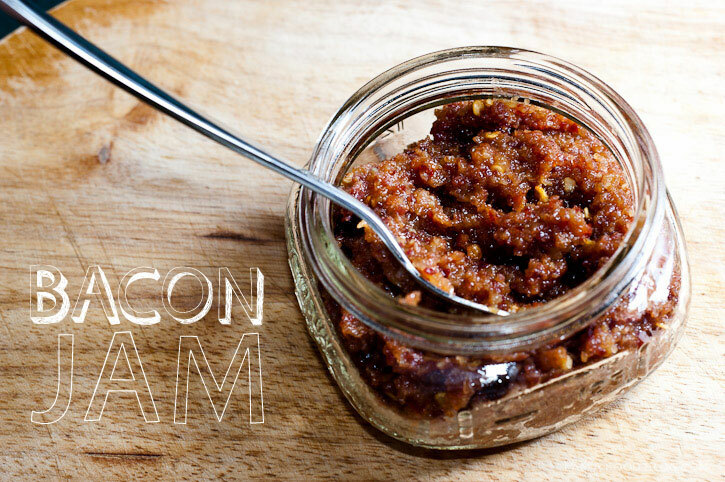 There are quite a few bacon jam recipes out there but most of them have ten gazillion ingredients. For the sake of simplicity, I cut out the coffee, which I imagine would have added a bit of complexity. Instead I tossed in some red chill flakes, because bacon’s great on it’s own, but add some spice and it’s twice as nice. 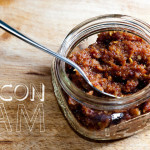 I am meaty, I am jammy: I AM BACON JAM! In a medium saucepan, cook the bacon over medium-high heat, stirring occasionally, until crispy and lightly browned. Transfer the bacon to a paper-towel lined plate. Pour off all but 1 tablespoon bacon drippings. Add onions, crushed garlic and chill flakes. Cook until onions are translucent. Add vinegar, brown sugar, maple syrup and bring to boil, stirring and scraping up the browned bits. Add the bacon back in a simmer on low heat until liquid is syrupy and thick, about 30 minutes. Transfer to a food processor and pulse. Enjoy on everything! Keeps in the fridge for 4 weeks. How long would something like this last in the fridge? It should last about 4 weeks. Looks like that jam found a home on some rainforest crackers. I just made those the other day because they were CRAZY expensive at Whole Foods. I’ve made jam, I’ve made bacon, but never the two together. This might be interesting. Can this be canned and conserved for a longer time? I’m not too sure as I haven’t tried it. I think making it in smaller quantities instead of holding it for a long time would be better though. this looks glorious. Is there any way to make this sugar-free? I haven’t made it sugar free, but I think maybe honey would work. I’ll bet you could make it sugar-free, or at least reduce the sugar significantly by using Agave syrup, a touch of molasses, and some maple flavoring. I can’t eat much sugar, so I’ll try it out and let you know! This year, I tackle bacon jam. It’s been on my “to try” list for too long. Thanks for sharing. You can you eat it as a dip or sandwich spread. Just put it on anything that needs a bit more bacon! One good use for bacon jam is as a topping on a steak. I ordered a rib eye at a great restaurant last night, and it arrived with bacon onion relish on top. Was incredibly good… I found your recipe here while searching for something like I had last night. I think this recipe is probably pretty close… Though they did not use a food processor as the onions were still in their original form. Will definitely try this and make a few tweaks in the hopes of recreating the relish I had last night. yes, rice vinegar would work too! I have to try this. Definitely going to show this to my best friend! Anyone tried to freeze a jar? Does the texture hold when you thaw it out? Thanks ! 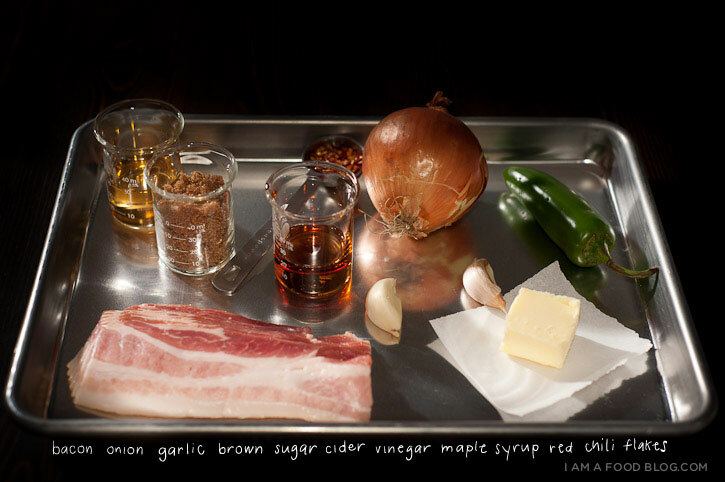 I haven’t made this yet but have to say, I love the way you layed out and photographed the ingredients. Where did you purchase the beakers? How it would go without brown sugar?? Can I use normal sugar? i haven’t tried with regular – it might taste a bit less caramel-y, but it would work! This was delicious! My only comment was I needed to remake the recipe as 1 tbsp of red chili flakes was WAY to spicy for my family, I remade it with 1 tsp and everyone was happy. Thanks! !